The folding bicycle market has exploded over the last decade, resulting in an amazing plethora of choices for the prospective buyer, over a wide range of prices. When I first made the choice to return to cycling, identifying which bike suited my needs best was not an easy decision. This is obviously something that many people struggle with, once they have already chosen to jump into the world of foldies. Day 1 with my not-so-shiny new Birdy. Most folks buy it for the convenience more than anything else, particularly if home is a fairly spatially challenged urban abode. However, I consider a bicycle an important investment that should not be taken lightly. I did a fair bit of research both online and offline beforehand, and took about six months to finally settle for what ticked all the right boxes. This process was exhausting, but I am secure in the knowledge that I made the right choice with no resulting buyer’s remorse. Since making my two-wheeled adventures public on social media, a number of people have approached me for advice on folding bikes. This is possibly due to the fact that the cycling lifestyle is a lot more widespread now in Kuala Lumpur, where I live. First of all, there will be traditional cyclists who will attempt to talk you out of what they feel is a useless purchase. You will be faced with a strong dose of skepticism over just how good of a ride you will get, from a bike that collapses into two (sometimes even three) pieces. I encountered the same sentiment when I first broached the subject, and this same person is also now the proud owner of a foldie, well on the way to upgrading their own set of wheels to the point of no return. I am obviously silently but extremely smug about this U-turn. Do you really need a folding bike? This is clearly the first thing to consider. Are you jumping on the bandwagon or have a real need for it? The key to dealing with naysayers and ensuring you have no regrets, is knowing exactly what you are buying, and precisely why you are buying it. Space considerations: Eka and I live in a box of a loft, and we utilise every single spare square foot we can. The traditional clever horizontal storage method on the wall does not work for us since most of the space is already used up. A pulley system and mount or pole mount for the ceiling is not a feasible alternative, because of the double storey height of our place. What we CAN do, is fold our bikes and tuck them under the stairs or the desk. Done deal. Commuting: A former colleague recently asked me whether her boyfriend should buy an IKEA city bike to supplement his daily commute to work on the newly completed MRT train, because waiting for the feeder bus simply took too long. In Malaysia and many other parts of the world, a foldie is the ONLY bike that will be allowed on the city trains, and even then, at controlled times. Essentially, foldies are your only choice when combining public transport and cycling, if you want to take it with you on the train. You can protest this until blue in the face, but the transport authorities will NOT budge on this matter so far. Their priority is the hordes of normal commuters. While I don't agree with this, I’d rather work within these limitations for now and find a solution for myself that works. Foldies are also easier to pack into a taxi, Uber or Grab. Easy transport: Folded up, these bikes fit easier in most cars without the need to invest in a rack. We generally drive either a 4WD or a hatchback, and both have enough room for three bicycles and one passenger in the back. Eka and I also have a strong dose of wanderlust as you can tell from our growing collection of rides, and the bikes are now our main mode of transport when travelling, supplemented by train rides in between (and air travel of course). They pack fairly well without much disassembly. Again, it all boils down to what you plan to use the bike for. There are some foldies that have been used for competitive cycling, but these are fairly high end and are a completely different story altogether. If you’re looking for pure performance, a full-sized bike will be a better choice. Let’s assume for the sake of argument, that your foldie purchase is for non-competitive use. I won’t go into the components and wheel sizes in too much detail, because from my experience, chances are most cyclists will not know their preferences until they have a significant amount of mileage under their belt. If you’re already a cyclist, you would have a decent amount of knowledge already. After a while you will also realise what other types of cycling you’d like to do, so preferences can also change over time. These items can be swapped out later anyway, if you change your mind or want an upgrade. Here are several other considerations that will make this task easier. Price: In Malaysia, foldies can range between an estimated MYR500 - MYR15,000, depending on the quality. If you include break-away bikes in the mix, the most expensive I have come across is MYR80,000. That’s double the price of my trusty hatchback car, which comes equipped with an engine. As with full-sized bikes, the golden rule is you get what you pay for. Most folks I talk to are fairly price sensitive, but I broke out of my own price limit when I realised that I wanted a certain level of riding comfort and certain features. Folding mechanism: There are three main types available in the country, and each have different pros and cons. This is often determined by the price as well. The most popular is the half or mid horizontal fold variety (Java, Dahon, Tern), although some cyclists worry that this design puts stress on the frame with heavy usage. The triangle hinge vertical fold (Birdy, Bike Friday) bikes are also gaining popularity, as these eliminate the problem of stress points, and often come with built-in suspension. The less common variety is the swivel fold (Montague). There are also bikes that feature two different folds for compactness (Brompton), or those that require minimal disassembly (Reach, Ori/Mezzo). There are also break-away foldies like the Alex Moulton, where the frame can be disassembled into two parts, but they cost a pretty penny. Weight: This will greatly determine how much effort is required to ride the bike, and whether you can move or transport it easily. The key is to match it to your chosen activity, and your physical capability. I have a back condition that means no heavy lifting, (a rule i break every now and then due to strength I’ve built up through weight training) and this was a huge factor in my own decision. There are foldies that weigh less than 10kgs, if you’re willing to pay for one. Ease of transport: This is obviously linked to the weight of the bike, in addition to the compactness of the fold. Some foldies cannot be wheeled when folded, which can be a problem when you need to lug it around in restricted areas like train platforms and inside buildings. Also, is air travel an important criteria? Ask yourself if you’d like to travel with the bike, because some foldies are easier to fly with than others. Wheel size: Folding bikes come in a variety of wheel sizes. For compactness, the 16” wheel size on the Brompton gives the most compact fold. The key thing to note about smaller wheels is that you will feel the imperfections of the road more than let’s say a 700c wheel. With that said, there are also a lot of folding bikes that use the larger 20” sizes (406 and 451) and they feel great on the road. In terms of acceleration, small wheels are pretty fast, but bigger wheels are still more suited for long distances. Suspension: Most foldies are made of either aluminium or alloy, so they do not absorb shocks in the same manner as traditional steel frames. Some offer no suspension at all, some have front or rear suspension built into their folding mechanism, some have both. If you plan to ride on more than just smooth tarmac, some form of suspension will come in handy. The Brompton is one of the few foldies with a chromoly steel frame that naturally absorbs shocks, which also helps to offset the smaller wheel size. Fully suspended models like the Birdy use elastomers for both the front and rear to absorb road imperfections and gives the feeling of larger sized wheels. In the end, it is always best to find a shop that allows you to do a test ride to get a good feel. Future upgrades: Is the foldie compatible with standard full sized bike components or specialised parts only? You’ll appreciate the wide range of choices when looking for specific components, something we experienced with our own upgrades. Availability: As I mentioned earlier, the market is saturated with products, and it can be hard to know what to buy. The same rule applies to the after sales service of cars. Bike retailers will be able to order a more obscure brand or model for you, but will they have the expertise to handle servicing or fixing the bike, or have the parts to do it? Do they have a direct relationship with the manufacturer? What kind of warranty can they offer? In the digital age, a wealth of information is always at your fingertips, available 24-7. There is no excuse for a bad decision based on insufficient research. Also, test ride anything and everything you can get your hands on, until you find the right fit. This was a crucial part of my process in creating a shortlist, which was whittled down until I found “the one”. It was not love at first sight with my Birdy, but rather the result of a painstaking, long and drawn out search. The first bike shop I went to, I remarked that the foldie felt wobbly, a common complaint. It is a fact that foldies are generally twitchier than full-sized bikes, but have the advantage of being more responsive. The lady who attended to me chose to patronise me by asking when was the last time I rode a bike. Needless to say, I was not impressed. The second shop I went to, the sales rep wasted his time explaining what foldies are, when what I really needed was advice to compare several different models. My main rule when it comes to sales folk, is that they must NOT be condescending, and must LISTEN to what I am saying rather than spew their normal sales drivel. (These two people shall remain unnamed as well as the shops in question; you’ll have to message me privately to know more). My eventual dealer of choice may have been influenced by the bike itself, but had he not been friendly or helpful or attentive, the sale would not have happened. He’s now an occasional ride partner, and we’re on good terms (Hi, Fei boss :D). Having said all that, here’s a bit of a cheat sheet (in alphabetical order) if you have no time or can’t be bothered to read a hundred reviews. Mind you, I won't be able to cover all the foldies in the market, just the main ones that I feel are good enough to be in your shortlist. Full-size geometry, 24" wheels, rear suspension only built into folding mechanism, minimal disassembly. Different models for speed, long tours and off-road. Customisable options, 20" wheels, designed to fit into a suitcase for travel or bike bag for commuting. No suspension. All-rounder performance foldie, 18" wheels, full suspension built into unique quick-fold mechanism. Compatible with wide range of bicycle components. Can be wheeled at an angle or with rear rack while folded. Read our long term review of the Birdy. Most compact fold, chromoly steel frame, 16" wheels, rear suspension built into folding mechanism. Fits into carry-on flight cases, and most universally accepted onto public transport. Easily wheeled while folded. Many colour options. Full-size geometry, 700c wheels. Patented swivel fold with strong clamp lock underneath top tube and secondary lock. Full suspension MTB, hybrid and road models available. Passed European Racing Bike frame test, EN 14781. Read our review of the Change Bike DF-702. 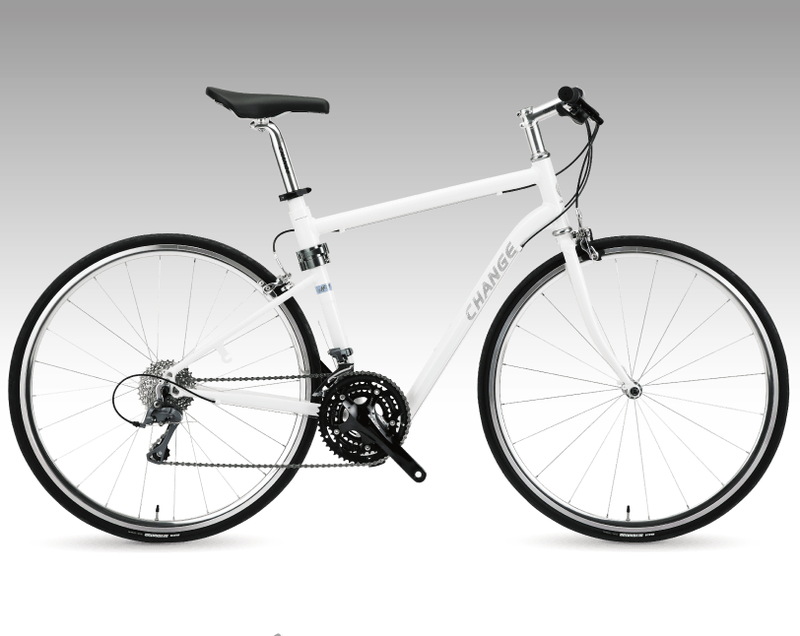 Best value for money, wide range of models but best known for urban cycling. Established brand made by the largest foldie-manufacturer in the world, holds patent for folding mechanism, compatible with wide range of components. Most affordable starter foldie, carbon frame model also available. Compatible with wide range of components. Full-sized frame, unique swivel fold system, minimal disassembly but no handlebar fold and no break in frame. Different models for on and off-road, folding MTB originally designed for US military paratroopers. Fastest folding mechanism, compactness similar to Brompton. Perfect for commuting, carbon frame model available for speed and lighter weight. Easily wheeled while folded. Full size geometry similar to Airnimal. Front and rear suspension in folding mechanism, requires minimal disassembly. Different models for speed and long touring. Read our review of the Reach. Similar value for money and quality as parent company Dahon. Often seen as an improvement to Dahon. Large selection of different models, including the base Link models to the more premium Verge and Eclipse offerings. Lightweight high performance design, built for speed but comes with weight limit. Compact fold, iconic slanted X frame. Several models available such as the FX and FXS which is the folding equivalent of a road bike, and the commuter friendly IVE. There are many other foldies sold in Malaysia at a wide range of prices, but this list is a compilation of the some of the best brands in terms of quality. The higher the price, the better the components and ride quality, which means you get what you pay for. If you're not doing serious cycling, it may be ok to skimp a little. Remember that in the end, your bike is a personal choice based on your preference and needs. Click on the links below to read our individual stories.